Cutting back road verges makes the highway look neat and tidy, and can sometimes be important for ensuring good visibility for drivers. But if left to grow, road verges could become an important habitat for all sorts of wildlife – and would provide stunning displays of wildflowers. More than 700 species of wild plants are found on road verges. But one in 10 of these are at risk of extinction – partly because councils cut verges too early, at a time when plants are in full flower and before they have had chance to set seed and reproduce. This is also bad news for the insects that rely on these flowers for food. Bees, butterflies, moths and other pollinators need the pollen and nectar offered by roadside flowers to survive. With increased use of pesticides and herbicides on farmland, insects are finding it more and more difficult to find food. Road verges that are left to grow naturally offer food, shelter and habitats for other wildlife too – and act as corridors that creatures can use to travel safely from one area to another. Such verges are also one of the most viewed habitats in the country, giving people direct contact with nature and the changing seasons – and an opportunity to enjoy the colourful blooms of wild flowers every day. While safety on our roads should of course take top priority, there are some simple steps that councils can take that will ensure safety for drivers and pedestrians – but at the same time give wild flowers on road verges a chance to survive and thrive. Plantlife is calling on members of the public to sign a petition to urge councils to do more to enhance the wildlife value of road verges. Treating road verges like mini meadows, and delaying cutting to allow flowers to seed is one such step. And trials in Dorset are investigating the use of semi-parasitic yellow rattle to stunt grass growth – this can combat the over-vigorous growth of grass on fertile verges, which is both detrimental to wildflowers and can obscure drivers' lines of sight. In a recent poll to find the nation's favourite wildflowers, 25 species were short-listed – and of these, 21 can be found in road verges. So if verges are left to grow, what flowers might we see brightening the sides of the road? Bluebells are one of our best-loved flowers – and the UK is one of the best places in the world to see them. 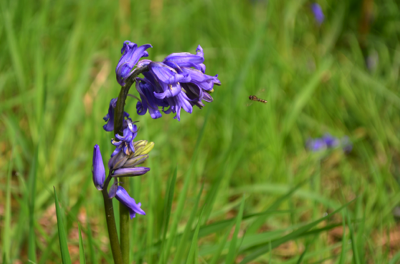 Although they're a fairly common sight in British woodlands – and they also grow happily on the roadside – bluebells are relatively rare in the rest of Europe, and are considered a globally threatened species. Instantly recognizable, and with a lovely scent, bluebells have vibrant, bell-shaped flowers that appear in May. Cowslips are another spring flower, with cheery, golden blooms, that are associated with many English traditions, such as being used in May Day garlands. 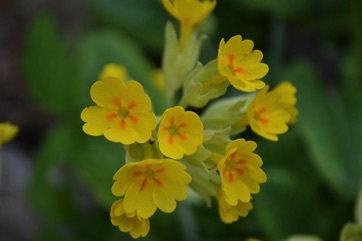 A cousin of the more commonly seen primrose, cowslips have suffered declines in recent years, and the swathes of yellow that would once have been seen in the meadows and woodlands of old are now a rare sight. Cowslips are an important source of early nectar for pollinating insects. Oxeye daisies, with their large, flat white flowers, are commonly seen on road verges throughout summer. The petals are so bright that they can glow at night-time, giving the flowers their folk names of 'moon daisy' and 'moonpenny'. Butterflies, bees and hoverflies love the nectar that can be found in the dozens of tiny yellow flowers that make up the sunny centres of oxeye centres. 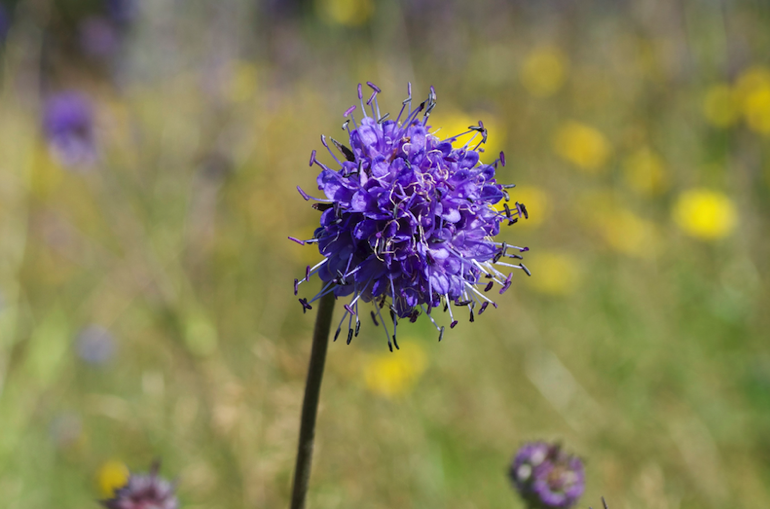 Devil's-bit scabious has tall stems and round, pincushion, purple-blue flowers that are extremely attractive to bees and butterflies. In particular, the declining Marsh Fritillary butterfly – classified as a priority species in the UK Biodiversity Action Plan – relies on devil's-bit scabious as a source of food. 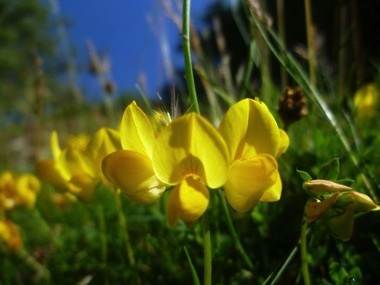 Bird's-foot trefoil has a wealth of folk names. Some of these, such as eggs and bacon, refer to its bright yellow and red-streaked flowers. Others – granny's toenails, devil's fingers – describe the long, bird's-foot shaped seedpods that appear in autumn. 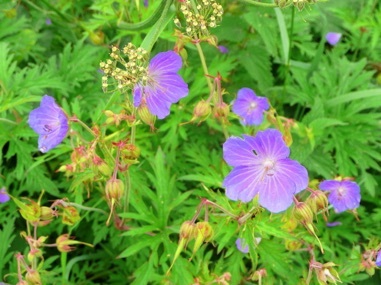 Meadow crane's-bill, a native geranium that flowers between June and August, is now more commonly seen at the side of the road than in meadows. It provides splashes of colour with its purple summer flowers and deep red autumn leaves.